This is an all in one weight gaining supplement that has been specifically designed to aid muscle repair and growth by providing muscles with a multi-stage release profile of protein, carbohydrates and added nutritents. USN has included their very own 'hyperbolic stack' which includes creatine monohydrate and di-creatine malate to give added power and muscle cell volume. Also included in this stack is, glycine which is believed to help stimulate the release of growth hormone, tribulus terrestris added for testosterone support and also taurine which can help to ensure maximal uptake of amino acids and nutrients. USN Muscle Fuel Anabolic also contains a multi-stage protein release profile consisting of whey protein concentrate and isolate, micellar casein, milk protein isolate, calcium caseinate and soy protein isolate. With this six multi-stage release it provides nutrients for fueling muscle recovery and therefore aiding the muscle repair and growth process. Adding to that is the added glutamine and branch chain amino acids (BCAAs) which helps with nitrogen retention, immune support and overall increasing endurance ability. USN have developed a four stage carbohydrate releasing profile in Muscle Fuel Anabolic, which consists of fast and slow releasing ingredients. Maltodextrin, dextrose monohydrate and fructose are the primary carbohydrate ingredients that provide an environment for lean muscular development and growth and optimal glycogen storage. 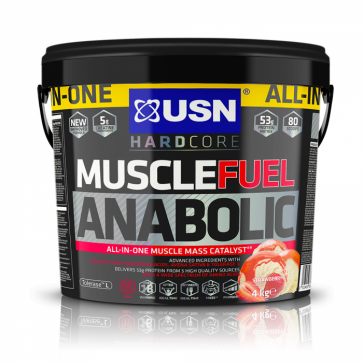 USN Muscle Fuel Anabolic comes in the following flavours: Chocolate, Strawberry and Vanilla. Packed into 3 bags contained within a 4kg tub, Muscle Fuel Anabolic is ideal as a meal replacement and post-workout shake. • Per serving, it contains a massive 50 grams of protein formulated into USN’s multi-stage release system. • A huge 14.3 grams of USN’s ‘hyperbolic stack’ of creatine monohydrate, di-creatine malate, glycine and tribulus terrestris. • Added taurine to facilitate the uptake of amino acids. • High BCAA and glutamine content for muscle repair and growth. • Added lactose enzymes to help with absorption. USN Muscle Fuel Anabolic should be used by anyone looking to add muscle mass (of age 18 years and over), such as bodybuilders and athletes who are on a mass gaining diet.